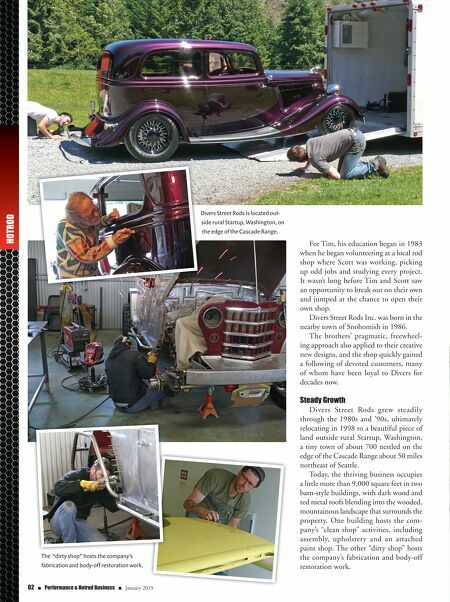 62 n Performance & Hotrod Business n January 2015 HOTROD For Tim, his education began in 1983 when he began volunteering at a local rod shop where Scott was working, picking up odd jobs and studying every project. It wasn't long before Tim and Scott saw an opportunity to break out on their own and jumped at the chance to open their own shop. Divers Street Rods Inc. was born in the nearby town of Snohomish in 1986. The brothers' pragmatic, freewheel- ing approach also applied to their creative new designs, and the shop quickly gained a following of devoted customers, many of whom have been loyal to Divers for decades now. Steady Growth Divers Street Rods grew steadily through the 1980s and '90s, ultimately relocating in 1998 to a beautiful piece of land outside rural Startup, Washington, a tiny town of about 700 nestled on the edge of the Cascade Range about 50 miles northeast of Seattle. Today, the thriving business occupies a little more than 9,000 square feet in two barn-style buildings, with dark wood and red metal roofs blending into the wooded, mountainous landscape that surrounds the property. One building hosts the com- pany's "clean shop" activities, including assembly, upholstery and an attached paint shop. The other "dirty shop" hosts the company's fabrication and body-off restoration work. Divers Street Rods is located out- side rural Startup, Washington, on the edge of the Cascade Range. The "dirty shop" hosts the company's fabrication and body-off restoration work.